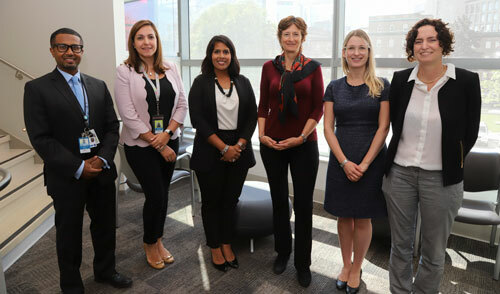 The Women’s College Hospital (WCH) Cardio-Rheumatology Program was established in 2017 as part of a wider collaborative network within the University of Toronto (U of T), to address current gaps in knowledge and care of cardiovascular diseases in patients with chronic rheumatic diseases. Through a collaborative model of care between rheumatologists, cardiologists and other allied health care providers, the program aims to improve the management of cardiovascular diseases in these patients through research, education and advocacy. Importantly, there are gaps in diagnosis and treatment of cardiovascular risk factors in this patient population, partly due to unawareness of the increased cardiovascular risk, and limited knowledge about and research into cardiovascular prevention strategies. To address these issues, the program hosted their first annual Cardio-Rheumatology Scientific Day at Women’s College Hospital on September 14, 2018. The event brought together 120 attendees, including physicians, nurses, allied health professionals, scientists and students. The event had informative lectures from experts in the field on the association between inflammation, cardiovascular disease and rheumatic diseases. Dr. Husam Abdel-Qadir (cardiologist and scientist, Women’s College Research Institute (WCRI), WCH and U of T) opened the day by outlining the role of inflammation in atherosclerosis and the use of anti-inflammatory and biologic medications to aid in prevention of cardiovascular disease. Dr. Lihi Eder (rheumatologist and scientist WCRI, Co-Director Cardio-Rheumatology Program, WCH and U of T) discussed the link between inflammatory arthritis and cardiovascular risk. She also presented data from WCH’s Cardio-Rheumatology Clinic, highlighting that 54% of patients seen in the clinic required changes in treatment, such as initiation of medication to lower cholesterol or high blood pressure. Dr. Shadi Akhtari (cardiologist, WCH), who runs the weekly cardio-rheumatology clinic, highlighted different approaches to assess and treat cardiovascular risk in rheumatic patients. These included the use of advanced imaging and recommendations for different types of medications. Dr. Paula Harvey (cardiologist and scientist WCRI, Co-Director Cardio-Rheumatology Program, WCH, and U of T) shifted the focus to lupus by providing case presentations and outlining its associated heart conditions, such as anti-malarial induced cardiomyopathy. Dr. Bindee Kuriya (rheumatologist, Sinai Health System and U of T) reviewed therapies and strategies for cardiovascular disease prevention in patients with rheumatoid arthritis. As rheumatoid arthritis is a “whole body” disease, she stressed the importance of multidisciplinary models of care needed to control disease activity and treat traditional risk factors (such as diet, smoking and obesity). Dr. Kate Hanneman (cardio-thoracic radiologist, Toronto General Hospital and U of T) described the strengths and limitations of using different imaging modalities (such as MRI and CT) to detect inflammation or lack of oxygen supplied to the heart and arteries. WCH Cardio-Rheumatology Scientific Day speakers (left to right): Dr. Husam Abdel-Qadir, Dr. Shadi Akhtari, Dr. Bindee Kuriya, Dr. Paula Harvey, Dr. Kate Hanneman and Dr. Lihi Eder. Following their lectures, the experts participated in a panel to discuss how to manage cardiovascular risk. Some of the topics discussed included the challenges related to delivery of care between rheumatologists, cardiologists and family physicians, the effect of non-steroidal anti-inflammatory drugs on cardiac risk, approach to screening for anti-malarial cardiac toxicity and others. Overall, the event brought together healthcare providers of different disciplines to shed light on an area that is not well known in rheumatology. To reduce the burden of cardiovascular morbidity and mortality, more research is needed in the area to inform development of disease-specific guidelines. Since rheumatic patients are also likely to have other co-morbidities, collaboration among family physicians, specialists and allied health professionals is needed to reduce cardiovascular risk. Looking to the future, early intervention and prevention of heart disease will require the development of disease-specific models that accurately stratify patients according to their risk of developing cardiovascular events.